The Americans with Disabilities Act (ADA) has established minimum requirements for public restrooms and commercial bathrooms. These requirements apply to all government, state, local, parks, recreational centers, and commercial businesses for new and altered construction sites. 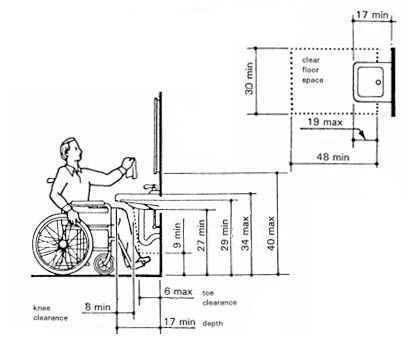 ADA bathroom layout guidelines are designed to protect people with disabilities and ensure that they have appropriate space in the public restrooms. Adherence to ADA guidelines is not optional. The American Disabilities Act is a civil rights law, established at the federal level, that prohibits discrimination against people with disabilities. The law has been set up so that each state and local government is to enforce this law with the appropriate building codes that require compliance with the 2010 ASA standards. 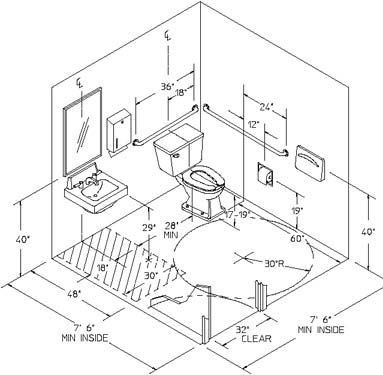 There are many guidelines to consider when building an ADA bathroom layout. There are specific dimensions that must be followed for handicap accessible restrooms. In fact, each restroom must adhere to specific dimensions for the grab bars, mirrors, sink, toilet, tissue dispenser, towel dispenser, seat covers, and hand soap dispensers. For single handicapped restrooms there must be a 60” diameter for a wheel chair in the room. The grab bars are located off the back wall 33”-36” from the floor and are 36” width. Another grab bar 42” length is also used at 33”-36” from the floor off the wall on the side. The mirrors must be ADA approved and are tilted to help the handicap. The bottom of the reflective mirror starts at 40” from the floor. Towel dispensers are mounted at 48” at the bottom of the dispenser from the floor. Toilet tissue dispensers are at 15”-19” from the floor. The seat cover dispensers are also at 15”–48” from where they grab the seat cover from the dispenser. The hand dryers requires a 30” x 48” clear floor space and mounted minimum 15” and no higher than 48” from the floor. Soap dispensers should be mounted no higher than 44” above the floor. 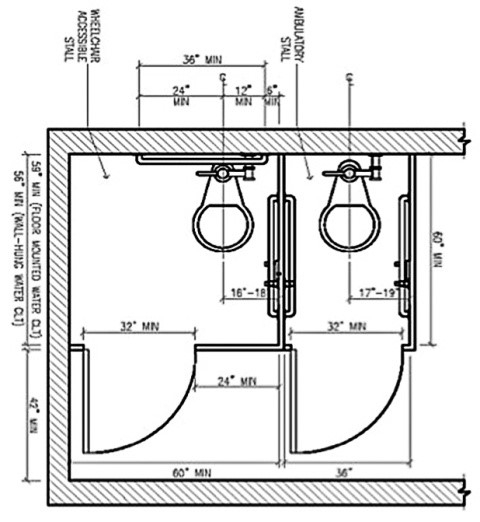 In a corner handicap stalls require a minimum of 60” x 60” compartment and is required with a minimum door size of 32” and the maximum size and more common is the 36” door. Ambulatory compartment stalls are 35” – 37” width and have a 32” door which is handicap prepped. These compartments require 60” depth at a minimum. Most handicap doors swing out for more room in the compartment. Having an alcove stall which is surrounded by three walls require 60” diameter on the inside of the compartment. A 36” stall door is used most often with a wheel fitting through that opening. Need Help Ordering ADA Compliant Restroom Materials? ADA compliance can be overwhelming and we want to help! When ordering ADA bathroom toilet stalls please send us your plans so we can quote you. We send all quotes with drawings to make sure everyone is on the same page. Our quotes include drawings, color charts, instructions and of course the quote that includes product, all the necessary hardware and shipping cost. Visit the partition quotes information page to request pricing or get additional information.